Imagine 4 year old children standing still. No way, you say? How about your 5 year old listening? What about your 6 year old being a leader? 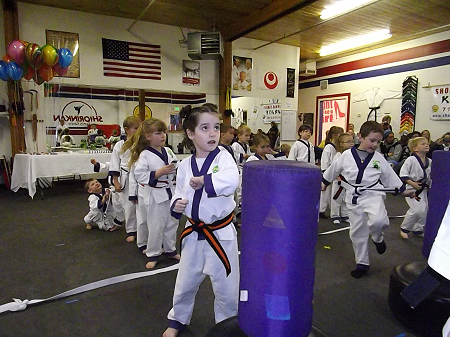 At Lil’ Dragon’s class, your 4-6 year old child will learn focus, self discipline and respect. It all takes place in a safe, high energy, high fun and high kickin’ class. Can your 4 year old ever learn to stand still? Will your 5 year old follow directions? Can your 6 year old learn respect? You bet they can! Many parents wonder if karate will teach their children how to "fight" and turn them into "Raging Ninjas". In reality, that is simply not the case. Karate, when taught in the proper way, is all about self control. It will teach them not to fight and have the self control to stop fighting. Not only that, it will give the confidence and wisdom to know when to use their skills in a dangerous situation. The all important skills of confidence, self control, focus, respect and honor that they learn in karate will help them the rest of their lives. Children who learn the necessary skills to focus at a young age learn faster in school, get better grades and get along with others. Karate is awesome for people of all ages and kids will reap the long lasting benefits of martial arts that will aid them throughout their entire life. To help you build confidence in your child and introduce them to the benefits of karate we are offering a three month start up package. Your child will get three months of karate, a uniform, student handbook and two belt tests all for only $178. There is no doubt that Lil’ Dragons will give tremendous benefits to your children! Besides all that – It is a lot of fun!! !